A rising young artist, Peerawayt Kraseasom has exhibited his work in Asia and Europe. His talent is based on his precision, dedication and wide imagination. 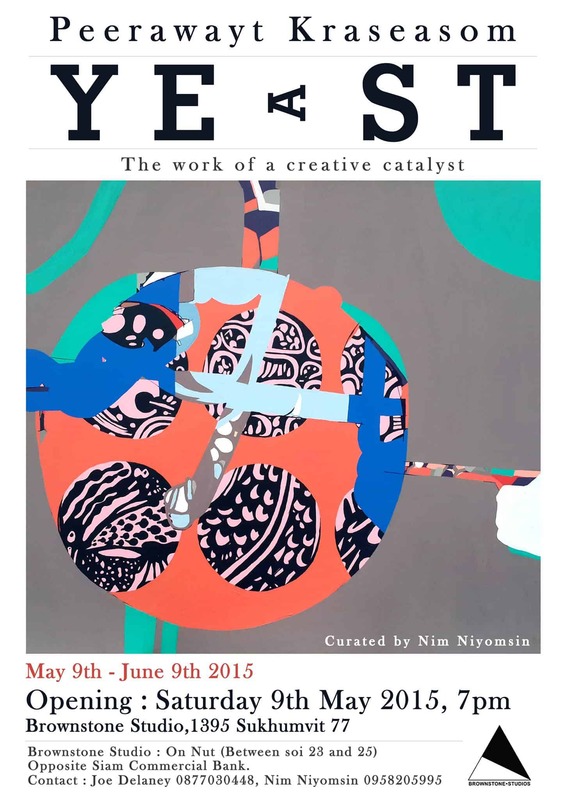 Yeast : The work of a creative catalyst’ is based on Peerawayt’s sketches and research over the past 10 years. It focuses on his thought processes, which later came to define his artistic identity. Natural objects have always been a fascination and inspiration for the artist. Initially a mere visual perception, they have become his personal subject matter. The process began as a breakdown of ideas into a sketchbook, prior to being part of his digital art experiments via the alteration of form and colour, and finally realised through the implementation of paint on canvas. This exhibition will give you a glimpse into the culmination of a decade of creativity. Unlike previous work by Peerawayt which tended to accentuate his brush stroke and its texture, work in this series is superflat in order to emphasize its shape and form, and to recall the flatness of sketch paper. As in fermentation, Yeast is a substance that starts a process of slow, even magical, transformation. In this series, Peerawayt’s creative mind initiates an interaction and interrelation linkage, blending his past and present. It is an autobiographical journey that represents the long process of catalyzation, starting simply with a natural observation, yet resulting in something so profound.